May 27, 2015 - Madill Equipment, a Nicholson Manufacturing company, announced the completion of the first Madill 124 swing yarder to be manufactured in Canada since 2007. Madill was founded as a blacksmith shop in Nanaimo B.C. in 1909 and, during the 1950’s, began manufacturing equipment for the forest industry. In 1955, the first spar tree yarder was invented and over the next 55 years, Madill manufactured over 4,000 forestry machines including yarders, log loaders and feller bunchers, making them a world leader in purpose-built forestry equipment. During the collapse of the forestry industry in 2008, Madill went into bankruptcy. In 2011, Nicholson Manufacturing acquired the assets and IP, and began manufacturing the machines in Sidney, B.C. Since that time, over 100 log loader and feller buncher machines have been manufactured at the Nicholson facility on Galaran Road in Sidney. “Completing the 124 swing yarder is a significant milestone for us as a local manufacturer and employer, and also for the forest industry as a whole, as focus has increased on creating safer working environments in steep slope harvesting operations” said Jeffrey. “In addition to the 124 swing yarder, we are also underway with manufacturing our first Madill 172 tower yarder, the last one having been manufactured in 2006,” Jeffrey continued. “The 124 swing yarder is a popular machine in B.C. 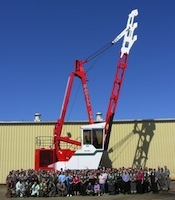 and New Zealand, and the 172 tower yarder is the machine of choice for the U.S. Pacific Northwest. We’ve sold the first 124 swing yarder to a New Zealand customer, and have already taken three orders on 172 tower yarders from U.S. customers with delivery beginning June 2015,” Jeffrey stated.